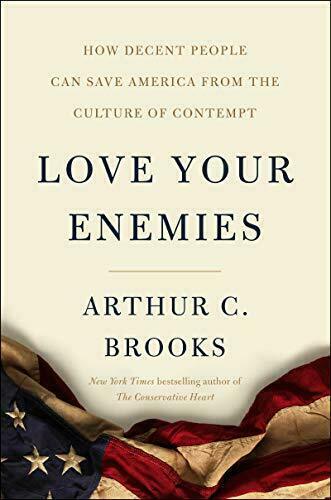 Arthur C. Brooks, Love Your Enemies: How Decent People Can Save America for the Culture of Contempt (HarperCollins, 2019), 243 pages, index and notes. Brooks is an economist and the director of the American Enterprise Institute, which he describes as a “center-right” think tank. He often draws from economic principals in a making a case for having a diversity of opinions at the table. He believes in competition in both the business world as well as in the marketplace of ideas. When there are more ideas and choices being discussed and debated, the chances of us coming up with a better solution increases. But when voices are silenced and viewed with contempt, we will all lose because the best ideas may be kept from rising to the top. Brooks begins his book by examining the rise of contempt in our culture. He draws from many fields to make his case. He insist that those on both sides of most arguments have values and to treat the other side as someone without values is the beginning of a culture of contempt. Our problem intensifies (and is undermined) when we use our values as weapons. He suggests that we all make friends and really listen to those with whom we disagree. Not only will this help us sharpen our own views, we might learn something. He also encourages his readers who feel they don’t like the other side to “fake it,” noting that just forcing a smile can help change our own outlook and help us to relate to others. The book ends with five rules in which we can resist the culture of contempt in our society. Resist “the powerful” (especially those on your side of the debate). When you just listen to the politician or the news media you agree with, you are easily manipulated. He encourages us to stand up to those who belittle others, especially those with whom we agree. It’s easy to stand up to those with whom we generally disagree. Get out of our bubbles and listen to and meet those from the other side. How else will we hear diverse opinions? Say no to contempt and treat everyone with love and respect even when it is difficult. Disagree better. Be a part of a healthy competition of ideas. Tune out: disconnect from unproductive debates. Brooks sees social media as a problem for our democracy as we find ourselves in constant debates in which no one changes their minds. Sabbaticals from such dialogue can be helpful to our own well being. Brooks is a committed Roman Catholic and while his faith is displayed throughout the book, he also demonstrates his openness to others. He is a good friend of the Dalia Lama from whom he has learned much. At the end of the book, he encourages his readers to become “missionaries” as we help with love and kindness to provide an alternative for the contempt in our society. This is a useful and timely book. I highly recommend it and hope it becomes a best seller. Interestingly, Brooks is donating all the profits for his book to the American Enterprise Institute. That’s an example of someone living the missionary life! This sounds excellent and I’ll add it to my wish list. The five rules at the end are wise, yet I can imagine being difficult for many to follow. I’ve always said it boils down to love. If we could truly just love one another, the world would be so different. Easier said than done. If more people could do #4 that would go a long way to people not getting so upset when they disagree about something. I’ve read similar articles about the lack of empathy, where many people today are either unwilling or just not able to put themselves in the other person’s shoes. Being unable to see another’s POV is indeed creating societal divide. Seems like sound advice to me. If everyone could just learn to show respect to others, that would be a giant step in the right direction. Social media debate wars solve nothing and only serve to create more divisions. Love and respect how important is of course. But this last years I heard terrible things and in not only America , here too,Many hate, really is terrible. This sounds really interesting Jeff. This sounds like a book that the world needs. I mostly avoid political discussions on social media because they’re rarely nuanced or respectful. I’d rather read a well-researched book or newspaper and form my own opinions. Social media arguments just make people angry.